a permit to use a veterinary chemical product. Generally, the Australian Government Department of the Environment evaluates environmental data on behalf of the states or territories, and then advises the APVMA. the potential harmful effects on aquatic and terrestrial organisms. This information is important in establishing whether the risk posed to any of these organisms by the proposed use of the product may be considered unacceptable or whether there are other concerns due to the behaviour of the substance in the environment. In contrast to assessments of agricultural chemicals, there is internationally harmonised guidance available to determine the environmental impacts of veterinary chemical products. This will be discussed in more detail under the heading ‘Relevant data’. The details of documents referred to in this chapter (including codes and standards) are provided in the References section. Applicants should be aware that many of these documents are updated regularly, and thus should make sure they use the latest edition. For veterinary chemicals, the International Cooperation on Harmonisation of Technical Requirements for Registration of Veterinary Medicinal Products (VICH) is particularly important (see VICH website). Along with Canada, Australia is an observer in the VICH program, which is a trilateral (European Union [EU]–Japan–United States [US]) program aimed at harmonising technical guidance for veterinary product registration. As noted below, two phases of environmental assessment have been agreed, Phase I and Phase II. The Environmental Risk Assessment Guidance Manual for agricultural and veterinary chemicals (EPHC 2009—referred to in this document as the risk assessment manual or RAM), developed through the Environment Protection and Heritage Council, is a useful document that provides more detailed explanations of how data are used in the assessment process. This document may be located on, and downloaded from, the Standing Council on Environment and Water (SCEW) web site. The VICH Phase I document indicates that it applies to veterinary chemical products other than biological products. The guideline for the registration of biological agricultural products is currently being reviewed and will be re-published following that process. This guideline will be a useful document to provide more detailed guidance when registering biological agricultural products. Under the legislation relating to agricultural and veterinary chemical registration, the APVMA, when granting or refusing a product registration application, must consider whether the proposed use of an active constituent or product, in accordance with the instructions for its use, may have unintended effects that are harmful to ‘animals, plants or things or to the environment’ (see the Agricultural and Veterinary Chemicals Code Regulations 1995 under the APVMA legislative framework). It is the Australian Government Department of the Environment that generally provides advice to the APVMA on environmental aspects of applications. an exposure assessment to arrive at a predicted environmental concentration or estimated environmental concentration (PEC/EEC)—to do this, considerations include the method of use of the product, scale of use, situations in which the product is used, and fate of the active constituent in the environment. Various models may be used to determine the PEC in relevant environmental media, for example, surface waters from run-off. For existing chemicals, monitoring data may also be considered. risk characterisation, relating the PEC/EEC to the most sensitive endpoints to determine whether or not the risk is acceptable and, if not, consider if or how risks may be mitigated by appropriate label advice or other action (see Figure 1). The assessment is based on the accepted principle that risk is a product of the exposure, fate and effects assessments of the VCP for the environmental compartments of concern. In this respect, it mirrors the approach described in the Data guidelines for agricultural chemicals. The assessment is based on a risk quotient (RQ) approach, which is the ratio of the predicted environmental concentration (PEC) and the predicted no-effect concentration (PNEC) on non-target organisms. The RQ (PEC/PNEC) is compared against a value of one. A value of less than one indicates that no further testing is recommended. 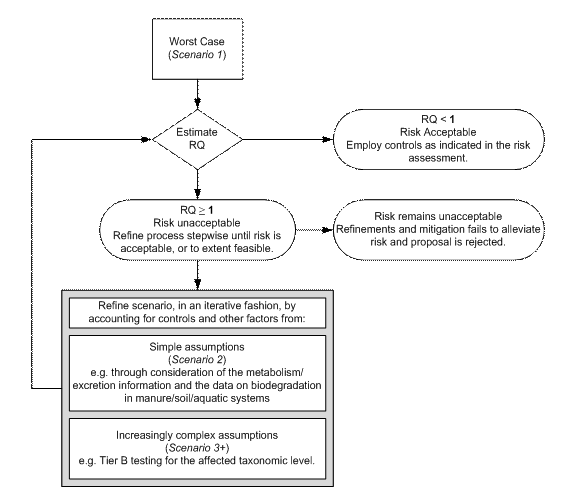 The risk assessment is an iterative process and is further refined if the RQ is more than 1, as described under ‘Environmental risk assessment’ and in Figure 1. As well as assessing data provided by the applicant, we consider information available from other sources, such as literature searches and foreign environmental agency reports (for example, from the United States Food and Drug Administration [US FDA] or European Medicines Agency [EMA] reports). other label instructions and warnings—such as, ‘toxic to aquatic life’. This section has provided an overview of Australia’s environmental risk assessment process for veterinary chemical products. The following two sections consider the types of applications and relevant data linked to these types of applications. In an effort to harmonise the environmental assessment to the maximum extent possible, VICH guidance is available. Two phases of environmental assessment are recommended by the VICH, with only the latter involving actual data generation. The VICH website has guidance on both Phase I and Phase II assessments. In Phase I, the potential for environmental exposure is assessed, based on the intended use of the VCP. It is assumed that VCPs with limited use and limited environmental exposure will have limited environmental effects and thus stop in Phase I and not proceed to Phase II. In Phase II, guidance is provided with respect to the environmental fate and toxicity data to be generated by you to obtain marketing approval in all VICH regions for those veterinary medicinal products (VMPs) identified as recommending data during the Phase I process. The APVMA has adopted the VICH harmonised guidance. Applications that either meet the VICH Phase I criteria or proceed into a VICH Phase II assessment will be assessed under a Part 7 (Environment) data module. The nature of the application determines which data module is relevant. The environmental data relevant to an application depend largely on the product’s expected environmental exposure. You should address all of the data elements discussed in the VICH guidance. If you do not submit data to address a specific element, you should request a data waiver against that specific element and justify the waiver with a valid scientific argument; for example, by demonstrating that environmental exposure to this group of organisms will be minimal. As noted above, the APVMA has adopted the VICH internationally harmonised guidance. Please follow the VICH guidelines, while taking into consideration the following comments. Data quality directly influences how confident our risk assessors can be in the results of a study and the conclusions they may draw from it. Therefore, your environmental fate and toxicity studies should be of sufficient quality for the study to be relied upon for regulatory decision-making. The process of determining the quality of data takes into consideration three aspects—adequacy, reliability and relevance of the available information to describe a given assessment endpoint. according to the Organisation for Economic Co-operation and Development (OECD) approach, as used by the Department of the Environment (described in Chapter 4 of the RAM). The documentation you provide should be complete, well organised and be presented in sufficient detail (for example, inclusion of raw data on concentrations measured or individual animal responses) to allow independent scientific assessment. You should supply copies of original reports. Summaries, or reprints of published material, usually do not contain sufficient detail and may therefore only be accepted if they contain sufficient detail to allow independent scientific assessment and achieve an acceptable reliability rating. If you believe that a particular data element in Phase II VICH guidance is not necessary, you should maintain the data heading, request a data waiver for the specific data element and provide a valid scientific argument as to why you have not submitted the data. In some circumstances, model data based on structure–activity relationships (SAR) may be accepted in lieu of test reports, particularly where models have been validated. You should not omit reports, including published material that could adversely influence the outcome of an environmental risk assessment. If you consider that such reports reach unsupportable conclusions, you should clearly justify this in the application. Your application should include details of any regulatory applications you have made for the same active constituent and/or product to other regulatory bodies in Australia or overseas. Where available, you should provide the results of those applications and subsequent regulatory decisions (for example, copies of assessment reports, or links to where these and/or regulatory decisions may be found). If any data in those submissions have been rejected by an overseas regulatory body, you should identify this and provide justification to support why you have included the study in question. Most VCPs first pass through the animal to which they are administered and, in general, the most significant environmental exposure results from the excretion of the active constituent, which is usually the parent and/or its metabolites. Therefore, test data on the active constituent are most important. However, for certain topical products (for example, applications of ectoparasiticides to sheep) or products added directly to water, formulation data may be the most relevant. For example, in aquaculture, when the product is applied directly to the aquatic environment for the therapeutic use on target organisms—and particularly if the product is used in the open environment—the unconsumed product may directly have an effect on non-target aquatic organisms. Therefore, in the latter case, formulation data could be relevant, including for combination products. VICH Phase II guidance includes results for physical or chemical properties. This is because details of the chemical and physical properties of the active constituent, in particular, are important to allow complete environmental evaluation of the product, as both environmental fate and effects information may be inferred from, for example, data on water solubility and partition co-efficient. hazard—effects on non-target species (environmental hazard). Aspects of these are explained in more detail below. The environmental fate and behaviour data of a VCP describe the degradation of the active constituents, through abiotic and biotic mechanisms, and their mobility, likely transport and final destination in the environment. These data are used to help estimate the predicted environmental concentrations in different environmental compartments—soils, sediment, water and dung—as appropriate, based on the proposed use pattern and physicochemical properties of the chemical. Following application of contaminated manures to soil or addition to water for aquaculture products, residues are generally assumed as being uniformly distributed in the compartment, even though distribution may be patchy. The route and quantity of a VCP entering the environment determines the risk assessment scenarios that are applicable, as well as the extent of the risk assessment that will be needed. The VICH Phase II guidance sets out a number of emission scenarios, using various assumptions. Emission can occur at various stages in the life cycle of the product and there may be some emission scenarios that are not applicable to a specific region. Environmental effects data are obtained from tests on standard organisms, representing organisms that are likely to be exposed to the VCP or to residues arising from its introduction into the environment. These data are used in conjunction with the anticipated environmental exposure and environmental fate data to determine the potential risk to non-target organisms, and the need for precautionary label statements or other risk management measures to minimise the potential for harm. The aim of the VICH Phase II guidance is to assess the potential for VCPs to affect non-target species in the environment, including both aquatic and terrestrial species. It is not possible to evaluate the effects of VCPs on every species in the environment that may be exposed to the VCP following its administration to the target species. Consequently, the taxonomic levels tested are intended to serve as surrogates or indicators for the range of species present in the environment. The specific test guidelines or protocols recommended in VICH Phase II are those finalised by the OECD or International Organisation for Standardisation (ISO). For example, the VICH Phase II guidance recommends you use a seedling emergence toxicity test to estimate the risk to non-target terrestrial plants from the spreading of contaminated manures on land. By following these guidelines you will have the advantage that the environmental studies you do are current and broadly acceptable to regulatory authorities on a worldwide basis. Lack of a specific study recommendation for a specific organism class in VICH Phase II, however, may not eliminate the need for this data in cases where environmental exposure to the specific organism class is likely based on the proposed use of the product. In these situations, it is up to the applicant to seek guidance from the APVMA. The VICH Phase II guidance contains sections for each of the major branches: (1) aquaculture, (2) intensively reared terrestrial animals and (3) pasture animals, each containing decision trees pertaining to the branch. The document also contains a section that lists the recommended studies for physical or chemical properties, environmental fate and environmental effects, as well as a description of how to determine when studies may be relevant. A two-tiered approach to the environmental risk assessment is used. The first tier, Tier A, makes use of simpler, less expensive studies to produce a conservative assessment of risk, based on exposure and effects in the environmental compartment of concern. If the assessment cannot be completed with such data—due to a prediction of unacceptable risk—then the applicant progresses to Tier B. The VICH Phase II guidance notes that in some cases it may be possible to implement a risk management option instead of moving to Tier B. In these cases, discussion with the APVMA is advised. The Phase II guidance notes that it should be recognised that risk management may not be identical for all regions and, where Tier B testing is omitted in one region, it may still be recommended in another. For certain VCPs, the VICH Phase II guidance notes that it may be necessary to go beyond Tier B, because more complex studies, specific to issues that need to be addressed or are specific to a particular region, are necessary to complete the risk assessment. It states that such studies cannot comprehensively be dealt with in a harmonised guidance document. Therefore, these issues are outside of the scope of the Phase II guidance, and should be addressed on a case-by-case basis with the appropriate regulatory authority. Examples include cases that exceed relevant trigger values in Tier B, where further testing may be warranted and/or risk mitigation measures may need to be implemented. The VICH Phase II guidance notes that, as risk management measures are not within the scope of this guidance document, no guidance on these aspects is possible. As noted above, it is assumed that VCPs with limited use and limited environmental exposure will have limited environmental effects and thus stop in Phase I. This is determined through the use of a decision tree that includes the trigger values of 1 µg/L and 100 µg/kg soil, which were established for aquatic and soil compartments, respectively. According to the guidance, if the predicted environmental concentration (PEC) value calculated is less than the trigger value, a Phase II assessment will not be required. In this way, Phase I identifies VCPs that should have a more extensive environmental assessment under Phase II. Some VCPs may go directly to Phase II (for example, some endo- and ecto-parasiticides and aquaculture products). In keeping with other types of chemicals—and consistent with the VICH Phase I guidance document, which mentions several times the production of a Phase I environmental impact assessment report—all new veterinary chemical products should undergo environmental assessment in Australia, regardless of whether or not they proceed to Phase II. The VICH Phase I guidance also indicates that additional environmental information should be provided for some VCPs—that might otherwise stop in Phase I—to address particular concerns associated with their activity and use. These situations are expected to be the exception rather than the rule, and some evidence in support for the concern should be available. The Department of the Environment thus considers on a case-by-case basis whether a new VCP can be stopped in Phase I, based on the exposure scenario and the nature of the active constituent. Experience with the use of the above trigger values has raised concerns that the uses of some new veterinary chemicals have been proposed, even though significant environmental exposure may result from the proposed uses of the chemicals. For example, chemicals used on a major proportion of the Australia-wide herd or flock, or in a number of intensive animal industry sectors, for which the potential environmental impact may not be properly considered in Phase I. The VICH Phase II guidance notes that the fate of chemicals in the environment is dependent on their chemical or physical properties and degradability. These properties will vary between the parent compound and the individual excreted metabolites. For example, the latter may be more water soluble than the parent compound and may also be more mobile and/or more persistent in the environment. In general, the data will be generated on the active constituent, yet the risk assessment should also consider relevant metabolites. This is particularly so for pro-drugs that are efficiently metabolised into a single metabolite for which testing may be more appropriate. Consideration of the excretion data is not initially recommended at Tier A, where a total residue approach should be taken and a PECInitial should be estimated. It should be assumed that the VCP is 100% excreted as the parent compound. If, for one or more of the tested taxonomic levels, the risk quotient (RQ) is 1 or more, the metabolism or excretion data from the residues, as well as the dossier requirements for absorption, distribution, metabolism, excretion (ADME) should be considered as part of the PEC refinement. It follows that you should include such data (summaries only) in the environment part of your submission, particularly for the target animals. Excreted metabolites that are 10 per cent or more of the administered dose and do not form part of biochemical pathways should be added to the percentage of active substance excreted to allow the PEC to be recalculated. If the RQ is still 1 or more after this PEC refinement and testing at Tier B, then guidance should be sought from the APVMA, including guidance on whether testing of the major environmentally relevant metabolites should be considered. As noted above, formulation data would be relevant in aquaculture if the product is applied directly to the aquatic environment, and particularly if used in the open environment. For products containing more than one active constituent, the combined effect of the active constituents on non-target aquatic organisms should be considered, and thus combination toxicity data for the aquatic compartment is relevant (for further details refer to Part 7—Environment (agricultural chemical products). You are encouraged to conduct your own environmental risk assessment, based on the expected environmental exposure arising from the proposed use volume and pattern, and to submit data and/or argument to address relevant data elements. This assessment is highly recommended, as it will identify which data elements require particular attention, and whether your data package contains appropriate information for evaluation by the APVMA. This risk assessment forms part of the crucial determination of which VICH phase is relevant for a particular application, as described above under the heading ‘Basic data elements used in environmental risk assessments’. As noted above, the VICH Phase II guidance contains sections for each of the major branches: (1) aquaculture, (2) intensively reared terrestrial animals and (3) pasture animals. In addition to containing guidance on the recommended test data to support a Tier A assessment, it outlines how to calculate PECs for surface waters, soil and sediment, etc and compare these with relevant effects endpoints. step 4—environmental risk characterisation that integrates the outcomes of the exposure and effects assessments to determine whether the use of the chemical according to label directions is likely to be harmful to non-target organisms in the environment. The exposure and effects assessments are interdependent, in that the exposure assessment will determine which data elements are relevant for environmental effects, while the effects assessment will determine the level of detail and refinement relevant for the exposure assessment. The procedures followed for environmental risk assessment are discussed in more detail below. The discussion is deliberately presented from a general perspective, as it is unrealistic to prescribe a specific procedure due to the variability of environmental exposures and risks across different products and use patterns. Further, some product types, such as sheep ectoparasiticides, have very specific data elements that do not pertain to general veterinary chemical products. Such examples are presented in more detail below under the heading ‘Specific recommendations for particular proposals’. Before any assessment work is undertaken it is paramount that a thorough understanding is obtained regarding the purpose of the application and the crucial issues, so that the assessment is relevant and irrelevant issues are avoided. The amount of chemical likely to be released to the environment is a central tenet of environmental exposure assessment. The Department of the Environment considers the chemical in the context of ‘cradle-to-grave’. The environmental exposure assessment will determine which compartment(s) of the environment (air, soil, water and biota) will be exposed to the chemical, and the likely level of exposure through its use as stated on the proposed product label and predicted market volume. This includes consideration of environmental exposure arising from the manufacture or formulation, and from disposal of excess or spent chemical (for example, dipping solutions, after appropriate treatment), unused product, and empty containers. You should provide the estimated quantity (in tonnes or litres) of chemical or product to be imported, manufactured, formulated or repacked up to, and including, market maturity. the proposed means of disposal of waste product arising from manufacturing, formulation and packaging operations (for example, spilled material and off-specification batches). the manure clean-out cycle of the animal housing, any treatment of manures (for example, whether manure is left to mature before spreading), the maximum spreading rate to land, and the likelihood of incorporation of manures after spreading, such as through ploughing, irrigation or rainfall. It follows that a good description of the specific animal husbandry practices for the target animals can be particularly useful to us; for example, are the pigs or chickens to be treated intensively farmed or will they be free range and what are the typical practices, flock sizes or housing requirements. The above information is all valuable when trying to calculate local PECs. From the above discussion it also follows that simply providing the PEC calculations done for Europe or North America is not satisfactory, as the calculations should be based on Australian practices. A description of the disease to be treated, its prevalence and contagiousness is also very useful and can give us a better understanding of the likely environmental exposure and how to derive more accurate PECs. ChemClear for the collection of unwanted rural and agricultural and veterinary chemicals. General label statements for the proper disposal of product and used containers can be obtained from the Veterinary Labelling Code. Furthermore, part of the Department of the Environment’s assessment and advice to the APVMA may include appropriate label disposal instructions for the particular product under assessment. the disposal site must be dedicated and adequately bunded (the soil should at least be 15 centimetres high). the drafting of suitable label statements. Chapter 5, Environmental exposure assessment of the RAM provides a more detailed discussion of the predicted environmental concentration, and provides guidance and more details on the range of environmental chemistry and fate tests. In particular, it provides details for the determination of estimated or predicted environmental concentrations (PECs). You should estimate PECs in surface and ground water, soil, sediment or dung, as appropriate under Australian conditions, depending on the use pattern. If no such exposure is expected in any compartment, you can request a data waiver and provide this as an argument for not providing particular data elements. The environmental exposure assessment is a stepwise or tiered process, under which PECs are first determined under worst-case conditions using simple screening models. If the initial PECs are at harmful levels, based on the environmental effects assessment, they are progressively refined to reflect more realistic exposures. In this way, the analysis for a particular chemical will be kept to a minimum, allowing resources to be directed towards chemicals with the greatest potential for causing ecological harm. The most significant route of aquatic contamination for many veterinary chemical products—particularly those that are persistent and mobile and are widely used within a catchment—is from run-off following spreading or disposal to land of manure that is contaminated with them. An OECD-based model (Probst et al. 2005) has been developed by the Department of the Environment that considers the edge-of-field concentration and we recommend you use this model to assess run-off and drainage. This model considers that the application rate, topography (in particular the slope of the field to which the chemical is applied), the magnitude of the rainfall and run-off events, and the persistence and mobility of the chemical are the most important factors by which run-off can be modelled. It also considers the placement of the chemical, an allowance for the heterogeneity of fields, and chemical bound to suspended sediment. The model is based on data available and considers a worst-case scenario of a 100 millimetre rainfall event, with 20 per cent of that water running off. On a hectare basis, this results in 200 cubic metres of run-off water. The model also does an initial screening that does not consider the properties of the chemical. Depending on the likely topography of the scenario to which manures containing the chemical are applied, the run-off water is assumed to carry 5 or 10 per cent of the applied chemical, after allowing for heterogeneity of the field. The model gives consideration to the interception and retention of the applied chemical by foliage for foliar applications, as well as incorporation into soils. Suspended sediment-bound chemicals are generally only considered for sparingly soluble chemicals with a solubility of less than 1 milligram per litre. This screen can be used to exclude low-risk chemicals from further consideration. If the predicted aquatic exposure from the screening model for run-off indicates that aquatic organisms may be exposed to harmful concentrations of the chemical, you should refine your assessment of the edge-of-field concentration. Exposure scenarios for run-off and drainage are relatively complex because the properties of the chemical and the soils where it is used will influence the mobility and stability of the chemical and, consequently, influence the levels of aquatic exposure. The OECD-based model (Probst et al. 2005) assumes three days for degradation of the chemical and the adsorption/desorption coefficient (Kd) value, usually based on the organic carbon partitioning coefficient (Koc) of the chemical and the organic carbon content of soil as determined by (ANRA 2001). The modelled, refined edge-of-field concentration may also be compared with any actual studies of run-off of the chemical of interest. Dilution of the edge-of-field water is considered in 1500 cubic metres of environmental water, which is equivalent to a one-hectare water body of 15 centimetres deep, or the daily flow of a low-flow primary stream. Initially, it is assumed that the water body is entirely fed by a 10 hectare field that is treated for 100 per cent at the maximum rate. Refinement of the model considers partitioning of the chemical to sediment using the same model as that used for determining the PECSediment as outlined in the RAM. The model is being further developed to consider the fate of the chemical in water and more hydrologically realistic catchments that consider the likely use pattern of the chemical in the catchment. In the case of animals grazing on pastures, a PEC may also be calculated based on excreta that may be discharged from sheep or cattle into a stream that is 1 metre wide, 100 metre long and 0.3 metre deep and flows alongside a one hectare pasture. This PECSurface Water is based on the guidance given by the European Medicines Agency (EMA) for sheep or cattle under a pasture scenario (CVMP 2007) that one per cent of the excreta ends up in the stream. However, an appropriate Australian stocking rate should be used as this is generally lower that the 10 animals per hectare used in the EMA guidance. As noted above for hydrophobic chemicals, rapid partitioning to the sediment may be expected. You can estimate the PECSediment from the PECWater based on the partition coefficient. More information about estimating the PECSediment can be found in the RAM. PECs in soil are usually based on the maximum spreading rate of manures to land, and the likelihood that the manures are incorporated into the soil after spreading, such as through ploughing, irrigation or rainfall. The PECSoil is used to evaluate the effects on soil organisms in treated areas. We generally assume a soil depth of 10 centimetres, but may decrease this value for chemicals that sorb strongly to soils, or increase it for more mobile chemicals. PECs in soil can be refined where needed by considering the persistence of the chemical in soil. the throughput of sheep for the particular dipping operation. A similar calculation may also be applicable for sheep held in a holding yard after dipping, in which case the sheep density in this yard would be relevant. The main outcome of the environmental effects assessment is to identify suitable effects endpoints for subsequent use in the risk characterisation. The suitability of an effects endpoint is likely to be dependent upon the extent of exposure to the various environmental compartments (surface and ground water, soil, sediment and dung), and the toxicity of the active constituent, and products containing it, to organisms inhabiting these compartments. The reliability of the study is also considered. Chapter 6, Environmental effects assessment of the RAM provides a detailed discussion of this step, including a very wide potential range of environmental effects tests. Again, the relevant data you should provide to support the exposure assessment is outlined in the VICH Phase II guidance. The RAM also mentions the possible use of quantitative structure–activity relationship (QSAR) models. As noted, these models are generally less useful in predicting the toxicity of agricultural and veterinary chemicals (as opposed to industrial chemicals) due to their relatively complex structures and because they have specific modes of action that are not easily incorporated into general structural relationships. You should use verified models in these situations. Any proposed use of surrogate data will be examined on a case by case basis, with the suitability of the proposed surrogate chemical expected to be examined through a quantitative analysis of the molecular similarity between active constituent and the proposed analogue(s) using the chemoinformatics software tool, OECD Toolbox for Grouping Chemicals into Categories. Chapter 8, Risk characterisation of the RAM provides a detailed discussion of this step. The basic principles, as applicable to veterinary chemical products are outlined below. As noted in the VICH Phase II document, the environmental risk assessment is based on the accepted principle that risk is a product of the exposure, fate and effects assessments of the VCP for the environmental compartments of concern. In this respect, the assessment mirrors the approach described in the Data guidelines for agricultural chemicals. The assessment is based on a risk quotient (RQ) approach, which is the ratio of the predicted environmental concentration (PEC) and the predicted no-effect concentration (PNEC) on non-target organisms. The RQ (PEC/PNEC) is compared against a value of one. A value less than one indicates that no further testing is recommended. However, in some circumstances, professional judgement is needed for a final determination. The PEC is defined as the concentration of the parent compound and metabolites predicted to be present in the soil, water and sediment or dung compartment. Worldwide harmonisation of PEC calculations is not practical or possible at this time. Therefore, the VICH Phase II guidance document does not contain any examples of PEC calculations, but gives some general qualitative guidance needed to determine PECs. However, when calculating PECs, you should take into account the regional differences in animal husbandry practices, the different environmental conditions in the VICH regions, and the differences in treatment rates and frequency. Therefore PECs calculated for Europe or North America are generally not applicable as these should reflect the Australian practices and conditions. You are responsible to determine the most appropriate method of estimating exposures for the Australian region for a particular VCP. The PNEC is determined by dividing the experimentally determined effects end-point by an appropriate assessment factor (AF). The AF is intended to cover uncertainties such as intra- and inter-laboratory and species variation, the need to extrapolate from laboratory study results to the field, and from short-term to long-term toxicity (acute to chronic ratios). The PNEC value varies depending on the type of study conducted. As always, you should clearly justify any variation in the applied AF in your submission. information to suggest that the chemical is rapidly degraded and not repeatedly administered, to suggest its application may not lead to chronic exposure. a series of refinements to the assessment process that account for other factors and results, by setting more realistic scenarios at each step—initially through consideration of the metabolism or excretion information and the data on biodegradation in manure, soil or aquatic systems (refer to Figure 1 above). The risk assessment approach that is recommended in the VICH Phase II guidance is to compare the PECInitial based on the total residue with the PNEC derived for each of the tested taxonomic levels, as described above. If the RQ for all taxonomic levels is less than one, this should be sufficient to conclude that the VCP does not pose a risk to the environment, unless, when based on the persistence of the active substance, there is a potential for it to accumulate in the environment. Where the RQ is one or more, a risk to the environment cannot be excluded and further assessment is recommended. The first step when refining the PEC, should be to refine the PECInitial based on the total residue at Tier A through consideration of the metabolism or excretion information and the data on biodegradation in manure, soil or aquatic systems. Excreted metabolites that represent 10 per cent or more of the administered dose and do not form part of biochemical pathways should be added to the active substance to allow the PEC to be recalculated. You should then compare the PECRefined with the PNEC for the affected taxonomic level and determine a new RQ for each. If the RQ is now less than one for all taxonomic levels, the assessment stops. If the RQ is still one or more for any of the taxonomic levels tested, then the assessment moves to Tier B and we recommend that you do additional tests for the affected taxonomic level as per the VICH Phase II guidance. For pasture treatments, if the RQ is one or more for dung insects for the PECDung-initial, then you should examine the excretion data and use the PECDung-refined to recalculate the RQ. The PECDung-initial assumes that the entire dose is excreted in a single day’s dung. The PECDung-refined is more realistic, as it takes account of how many days the active substance is excreted in dung and at what concentrations. If, after using this refinement, the RQ is still one or more, you should seek further guidance from the APVMA. Where levels of concern are exceeded, you should propose measures such as label instructions to mitigate the risk. For example, labels could require the observation of wool withholding periods to protect aquatic environments following scouring of wool. Due to the intrinsic nature of the data, we recommended that you submit a comprehensive data package for products with specific use patterns and/or situations; for example, sheep ectoparasiticides. An example of a specific use situation (using sheep ectoparasiticides) has been included below to demonstrate the additional data elements that are required in such a situation. Special considerations apply for the assessment of sheep ectoparasiticides. These include taking into account sheep wool residue depletion data, and the fate of these residues during the wool scouring process. Further information can be found in the Sheep ectoparasiticides report. An Emission Scenario Document (ESD) is a document that describes the sources, production processes, pathways and use patterns of a product, with the aim of quantifying the emissions (or releases) of a chemical into water, air, soil and/or solid waste. There are a range of Emission Scenario Documents prepared by the OECD for various situations. These may provide useful guidance to applicants in preparing risk assessments for some veterinary chemical product situations. These documents may be located on, and downloaded from, the OECD web site. Many of the ESDs listed on the OECD website pertain more to industrial than agricultural or veterinary chemicals, but, the following document may be useful for products considered to be veterinary chemical products: Series No. 14: Insecticides for stables and manure storage systems. The list of ESDs is continually growing, so you should regularly check the website for updates. OECD scenarios are likely to be worst-case scenarios, and should be adapted as appropriate for local situations. When preparing submissions, you are advised to follow the VICH guidance documents located on the VICH website. Applicants seeking further information on relevant environmental data for specific uses may wish to apply for pre-application assistance or make an application for a technical assessment. ANRA 2001, Australian agriculture assessment, National Land and Water Resources Audit, Australian Natural Resources Atlas, available at nrmonline.nrm.gov.au/catalog/mql:892. CVMP 2007, Guideline on environmental impact assessment for veterinary medicinal products in support of the VICH Guidelines GL 6 and GL 38 (EMEA/CVCP/ERA/418282/2005-Rev.1), Committee for Medicinal Products for Veterinary Use, European Medicines Agency, London. EPHC 2009, Environmental risk assessment guidance manual for agricultural and veterinary chemicals, Environment Protection and Heritage Council. (Now available at www.nepc.gov.au/resource/chemical-risk-assessment-guidance-manuals). Probst M, Berenzen N, Lentzen-Godding A, Schulz R. 2005, ‘Scenario-based simulation of run-off-related pesticide entries into small streams on a landscape level, ScienceDirect—Ecotoxicology and Environmental Safety, available at www.sciencedirect.com/science.